BUY NOW AND DON’T MISS THE CHANCE TO WIN $I,OOO! Bucky Ontario has a plan — one that will lead him from businessman to elected official. But an invitation to his new boss’ house party turns into an investigation into the murder of his friends. In addition, a simple favor to help a friend retrieve a family heirloom adds more intrigue into his life. When prominent, and less prominent, citizens are implicated in crimes, Bucky has a huge decision to make: will he expose the evidence he has come across or will he let political pressure keep him silent? Readers will be drawn into the lives of the diverse and complex characters of 1950s Defiance, Oklahoma, and will look forward to seeing them in other installments. ~ Edith Parzefall, author of the Hangman of Nuremburg historical mystery series. “Brier’s launch of his ’50s, small-town Oklahoma mystery series is…refreshingly different. Filled with fast-paced action and delightful devil-may-care, good ol’ country rednecks, this intriguing and oftentimes humorous mystery is one you won’t unravel until the end. Get ready to laugh, shake your head, and bite your nails–all at the same time. ~ Pepper O’Neal, author of the award-winning Black Ops Chronicles series. TAYLOR JONES SAYS: In The Killer Who Hated Soup by Bill A. Brier, Bucky Ontario is an eager and enthusiastic young man fresh from Louisiana, who heads for Defiance, Oklahoma, which in 1956 is consider to be the next great boom town. Bucky has big plans, but those go awry when his new friend is murdered and the town seems to want to cover it up, leaving Bucky determined to solve it on his own. For an historical mystery, the story is remarkably fast-paced and riveting—a page turner from beginning to end. 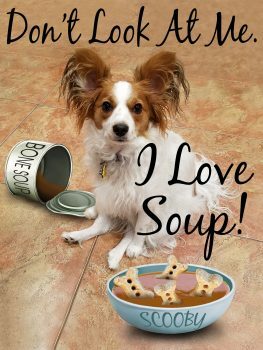 REGAN MURPHY SAYS: The killer Who Hated Soup by Bill A. Brier is a historical mystery of the first-order. Bucky Ontario has big dreams for his future, and he decides that a new boom town in Oklahoma is the place to make them come true. And once he gets off the bus in Defiance, he doesn’t waste time going from a menial labor job to selling cars in a short span of time and determined to make a success of it. But when a new friend is murdered, Bucky’s plans change, and now his focus in on solving the murder, which the town leaders don’t seem to care about. In fact, they seem to be covering it up. Brier has created amusing but realistic characters and interspersed his fast-paced action and tension with flashes of humor, making the story not only gripping but fun to read. 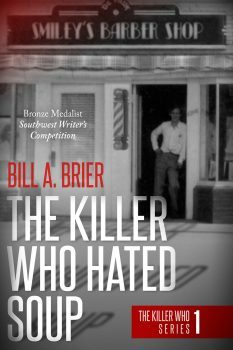 The Killer Who Hated Soup by Bill A. Brier is the first book in the new Killer Who Hated series, featuring amateur photographer/sleuth Bucky Ontario and his adventures in the fictional town of Defiance, Oklahoma. Bill A. Brier has a list of credentials that lend themselves to storytelling: he grew up in California, attended Hollywood High School, and worked in the movie business for more than 25 years in roles that included cameraman, film editor, and general manager. He also served in the U.S. Air Force as a combat cameraman and earned a master’s degree in psychology. Eight years ago, Brier switched from reading scripts to writing mysteries; his first, The Devil Orders Takeout, was published last April. Now, he’s back with The Killer Who Hated Soup—the inaugural title in a projected new series set in the fictional Midwest town, in the 1950s. The cold air stung his face like porcupine pricks, and it felt electrical. He loved the outdoors, and he loved Defiance. It was his kind of town—a town primed for growth. A town where folks were friendly and waved to one another. Where they drove fast in town to show off their cars or pickups and slow on the highway to save gas. Where a cashier would start a detailed conversation about anything from paving sidewalks to building racetracks when someone only wanted to buy gas and enjoy a Nehi pop. Under the tutelage of Dale Carnegie’s seminal book, How to Win Friends and Influence People, Bucky has set his sights on becoming town mayor. But first, he must ascend the social ladder. Consequently, Bucky has left his job at the local grocery store to sell cars for Cal Alsop’s Chrysler dealership. Beyond being the boss, Alsop is also chairman of the town council. It’s following a party at Alsop’s home that two of the guests—Will Chambers and his sister, Miss Iris (Bucky’s friend/neighbor)—die in a tragic car “accident.” Unsatisfied with that conclusion, Bucky does a little sleuthing of his own and helps the police, led by Chief Parker, uncover the truth: that the vehicle’s brake line was cut—and that there’s a cold-blooded killer on the loose. Given that Chambers had a plum job at the dealership, suspicion falls on a co-worker named Kansas; not only has he been gunning for said position but his reputation as a hothead precedes him (as do rumors of an illicit relationship with his own daughter, Marybeth—gossip that’s propagated by the town’s Deputy Chief Harman). Meanwhile, Bucky is drawn into a second mystery when he agrees to help his friend Kindra reclaim a ring that belonged to her deceased mother. Kindra lent the piece to Marybeth, who she insists was secretly pregnant at the time. Though no child has surfaced in the wake of that alleged pregnancy, Bucky has reason to suspect a coverup (literally). He and Kindra persist in their recovery mission and are eventually rewarded with this tantalizing nugget: Find the baby, find the ring. Despite a murderer at large (among other felonious occurrences), the town is consumed with an imminent celebration of its 50th anniversary. Over the objections of fellow council member Maynard Johnston, the group, spearheaded by Alsop, decides to commemorate the occasion by creating a time capsule within a 1957 Plymouth Belvedere and burying the car for a future generation to unearth. But when preparations commence, the designated plot of land is discovered to be a potential Indian burial site, putting the whole ceremony in jeopardy—and pitting the resident tribesmen against those who took their land. By virtue of his likability and those aforementioned camera skills—the police department is lacking a photographer, conveniently—Bucky finds himself an insider in the investigation. While this solidifies his relationship with Alsop and Chief Parker, it draws ire from Kansas and Harman, who impede his efforts at every step. Though perhaps a bit overeager in his tactics (and undereducated in the law), Bucky’s intentions are good if not always fruitful. Still, a growing body count, a shifting balance of power, and murky town politics demand a reckoning—and Bucky may just be the man for the job. The narrative unfolds chronologically and is told in multiple (third person) perspectives. This allows readers a glimpse into the secondary characters’ personal motivations, political agendas, and the proclivities that often bridge the two; it also ensures that those characters are multi-dimensional, as opposed to mere reflections of Bucky’s observations and opinions. Not only does this make the reader complicit in their knowledge of certain things that elude Bucky but it also maintains a sense of urgency and imminent danger. The Killer Who Hated Soup is a contagiously high-spirited and blissfully low-tech whodunit that introduces a likable new protagonist making his way in a town that, despite outward appearances to the contrary, lives up to its bold name. Bill A. Brier balances a cinematic eye with old-fashioned storytelling sensibilities; the result is a richly atmospheric and often humorous tale that never takes itself too seriously but keeps your full attention all the same.